Apparently looking to cast a Ryan Seacrest type for its coverage of the 2016 Olympics—and disappointed to learn that the brilliant A Ryan Seacrest Type exists only in the fertile imagination of the writers of BoJack Horseman—NBC has announced that it’s hired American Idol host Ryan Seacrest to handle the late-night reporting for the upcoming event in Rio. 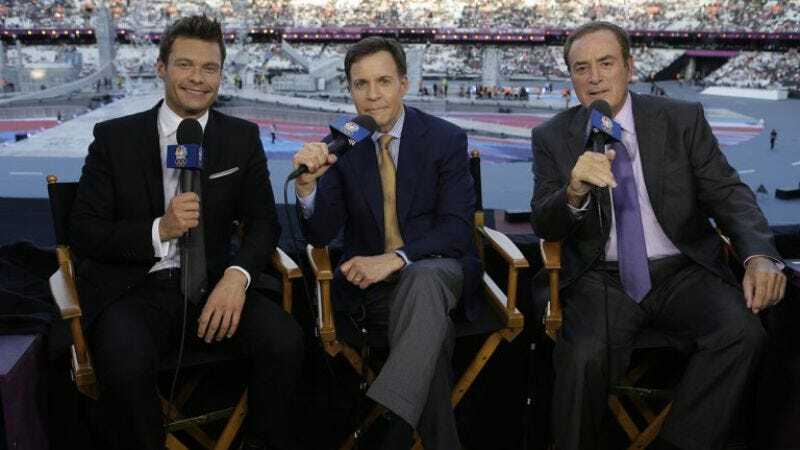 Seacrest will be taking over the late shift from Bob Costas, who handled both the regular and graveyard broadcasts in 2014, at least until individual portions of his body started to give out in revolt against the strain. The relatively young and fresh Seacrest will hopefully be able to relieve some of that weight, especially since he’ll be nice and rested from not having much to do between now and then. A veteran broadcaster and radio host, Seacrest worked on NBC’s 2012 coverage as well, teaching older members of the Olympic demographic about social media, and reminding viewers about the existence of people who have pretty nice hair. Next year, though, he’ll be focused on doing “a mix of interviews, human interest stories and a round-up of the day’s news,” drawing on his deep background in sports—he hosted both ESPN’s Radical Outdoors Challenge and the American-Gladiators-but-for-children program Gladiators 2000 before signing on for Idol—to cover the important issues, like whether the athletes did a great job, and whether they’ve got any folks back home who are proud of how they did.